You can create some great writing exercises by using materials offered on sites such as MLB.com. Students interested in writing journalistically – sports or otherwise – invariably take similar approaches and make comparable mistakes. Language tends to be the biggest challenge for many students, whether that means a reliance on clichés and jargon, an inability to write precisely or concisely, or an overusage of inflated and hyperbolic language to display key moments or trends in games. Let’s address some of those related to an exercise I developed for my sports journalism course. Grammar and spelling are typically problematic for newer sports writers across all areas of study – and, regardless what anybody says, these problems are not endemic to the current generation. Few, if any of us who graduated high school in 1981, understood gerunds, split infinitives, dangling modifiers or apposition. But we probably had a better vocabulary because we regularly read newspapers, magazines, books and spent far fewer hours watching TV, video or Vine. We were also asked to write significantly more than today’s students. My own daughters were asked to write only about an essay a year in their honors English courses here at Charleston High School – and they frequently did not receive feedback on these papers. Sickening. Sadly, I imagine that’s the case in many school districts today. So we need to spend even more time on grammar and sentence style, although it should not consume a course such as Writing For Sports Media. I offer a few suggestions here and there during in-class writing assignments. No doubt, the times are still a-changing. For this post, though, we’ll stick closer to sportscentric elements related to sports game stories. This lead has many solid elements: a key play, the names of the two teams, the day, and the score. There are a few elements missing from this story, namely a controversial double play at the plate that turned back a Royals rally in the late innings. 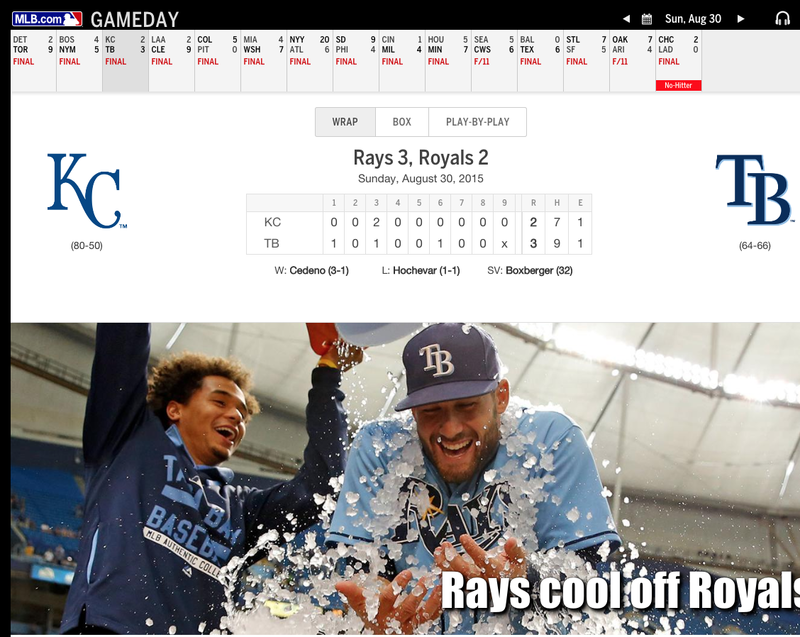 Secondly, the lead addresses two actions: that the Rays were spurred by a home run and that they held on to defeat the Royals. Would be stronger if the writer had focused on a single element – or, at least, had offered more details on how they held on to win. In this case, that would be the unusual double play. Not a fan of the intro clause either, but it could be acceptable had other details been inserted. ST. PETERSBURG, Fla. — A late comeback bid by the Kansas City Royals was stymied by a strange and disputed double play. Batter Kendrys Morales was tagged out near the batter’s box after a play at the plate to end the top of the eighth inning of the AL Central-leading Royals’ 3-2 loss Sunday to the Tampa Bay Rays. Eliminate commentary. (“Fortunately for the Rays, things didn’t get any better for Kansas City starter Nathan Kams.”) Another student incorrectly wrote: “Nevertheless, the Rays were happy to take whatever play went their way after having a rough time the past several weeks.” Unless somebody told this to you, this is commentary and/or guesswork. Delete it. Increase their knowledge of sports. Of course, this takes time. The Field Guide offers insights into covering 20 sports, but there are many other resources that can also educate: league websites, sports rule books, and books by authors such as John Feinstein, Roger Kahn, Michael Lewis, Roger Angell, and Bob Ryan. Plus, students need to devour good writing found in newspapers, websites, and magazines every single day. Put the winning score first. “The Yankees lead the Blue Jay, 4-0” and also “The Blue Jays trail the Yankees, 4-0.” In tennis, you would write “Serena Williams defeats Venus Williams, 6-2, 5-7, 6-1.” In tennis, a player often both loses and wins matches. Ultimately, we lead with the player who won overall. So that could mean that “Rafael Nadal defeated Andy Murray 2-6, 4-6, 7-5, 6-4, 6-0.” He lost the first two sets, but he won overall. A team or player ties the score, not the game. The Bears scored a last-minute touchdown to tie the score, 17-17. Also: The Blues and Predators were tied at 2 apiece through two periods. It takes time for students to learn new skills and to eradicate bad habits. Give them time and you’ll start seeing progress during the semester, especially for those students who are working the hardest. To reinforce these lessons, you might want to ask students to write reflective pieces on professional sports stories, especially those associated with class assignments, such as this one I used in class. You can download additional class materials I used for the in-class baseball game story exercise by clicking here and here. And here are stories written by each city’s hometown publication in St. Petersburg and Kansas City. This entry was posted in Teaching sports journalism and tagged sports journalism, sports journalism education, sports language, sports ledes, sports media education, sports writing, sportswriting, teaching sports writing, writing for sports media, writing sports leads. Bookmark the permalink.